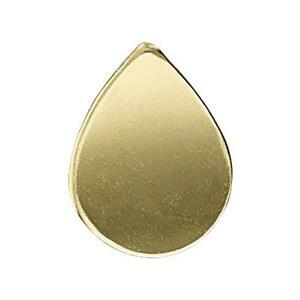 This 14/20 gold-filled teardrop is ready for anything. Drill multiple holes in it as a design element, stamp it with your favorite metal stamps, or add small solder ornaments to it. If you are familiar with soldering gold-filled items we sell 14KYH plumb solder in easy and hard, however it takes specific training to attempt soldering gold-filled items. In addition, all gold filled items should be plated where the jewelers’ brass is exposed.